Kaka tops the list of Major League Soccer’s highest-paid players for a third straight year. FORMER BRAZIL STAR Kaka topped the list of Major League Soccer’s highest-paid players for a third straight year, according to official figures released on Tuesday. 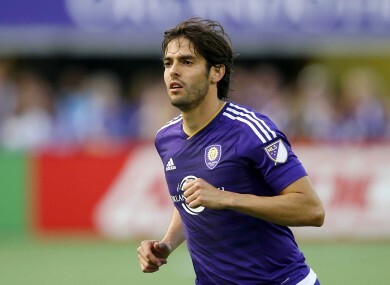 A comprehensive breakdown of basic salary and guaranteed earnings issued by the MLS Players Union showed Orlando’s Kaka coming out on top with wages of $7.168 million (6.553 million euros). The 35-year-old 2007 FIFA World Player of the Year headed to MLS in 2014 after a second stint with AC Milan. The top 10 highest-earners in MLS are dominated by foreign players, with Toronto’s Italian international Sebastian Giovinco second on the list with a salary of $7.116 million. Giovinco’s Toronto team-mate, United States skipper Michael Bradley, is third with a salary of $6.5 million. New York City FC’s duo of Andrea Pirlo and David Villa were fourth and fifth on the list, earning $5.915 million and $5.61 million respectively. Chicago Fire’s recently arrived former Bayern Munich and Germany star Bastian Schweinsteiger was seventh with a guaranteed $5.4 million. US internationals Jozy Altidore ($4.875 million) and Clint Dempsey ($3.892 million) were eighth and ninth on the list. Argentinian midfielder Diego Valeri of the Portland Timbers rounded out the top 10 with a salary of $2.607 million. At the other end of the scale, several players in MLS earn the minimum wage of $53,004 a year. Email “Kaka, Andrea Pirlo and the top 10 highest earners in MLS”. Feedback on “Kaka, Andrea Pirlo and the top 10 highest earners in MLS”.